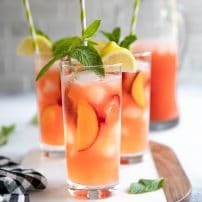 Cherry Strawberry Lemonade Sangria, a delicious twist on the more well-known white wine Strawberry Sangria Recipe, is made with fruity red Pinot Noir, fresh summer strawberries, cherries, spiced rum, strawberry lemonade, basil, and sparkling water. 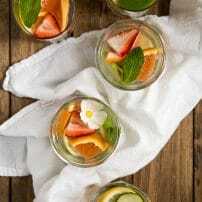 Delicious year-round, this easy strawberry sangria recipe is sure to be your new favorite cocktail. Cherries and strawberries are two of my all-time favorite summer fruits. They’re sweet, they’re delicious, and they taste good with just about everything. My other favorite thing is wine. Wine always tastes good with everything. 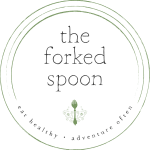 So, the other evening as I drank a glass of my favorite red wine and ate a bowl of this delicious summer fruit, I closed my eyes an imagined I was on vacation…in Europe…with tapas. So, anyway, I got to thinking about my time in Spain way back in 2010 (read about it HERE and HERE). 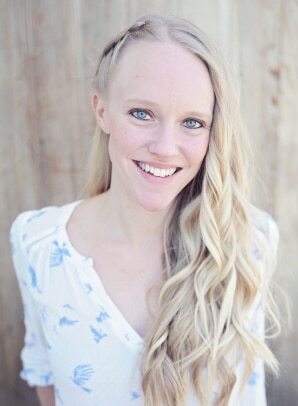 A time before motherhood or any serious responsibility. And then I remembered the SANGRIA! 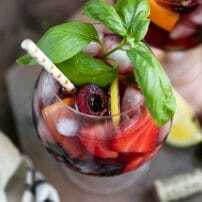 Sangria is a Spanish drink or punch, consisting of wine, chopped fruits, sugar or juice. Sangria is commonly served throughout all parts of Spain, as it is the country’s more popular drink. 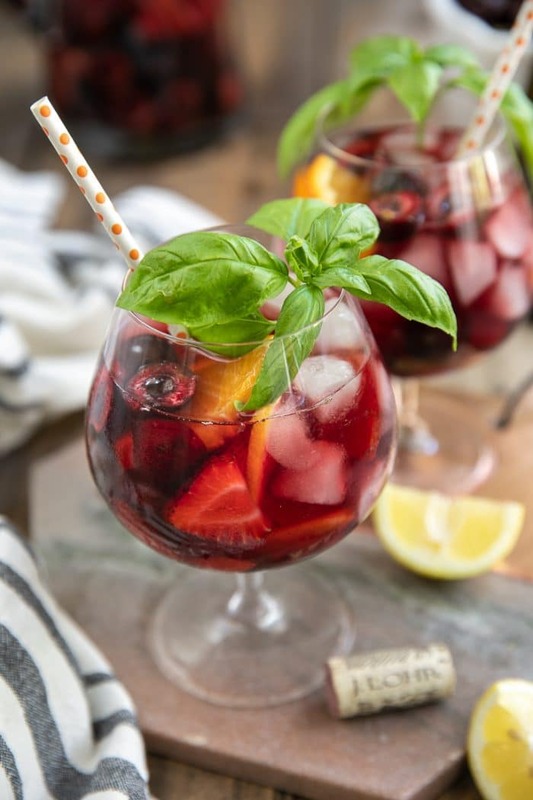 It is believed that Sangria dates back to the Middle Ages when water was unsafe to drink. The word “sangria” comes from the Latin word for blood. Traditional sangria was made with red wine, chopped fruit (particularly orange and apples), orange juice, and brandy. WHAT DOES THIS CHERRY STRAWBERRY LEMONADE SANGRIA TASTE LIKE? It tastes like fruit punch mixed with grape juice…but better. Because there’s wine and rum in there. This is no classic sangria recipe, my friends. But I’m getting ahead of myself. 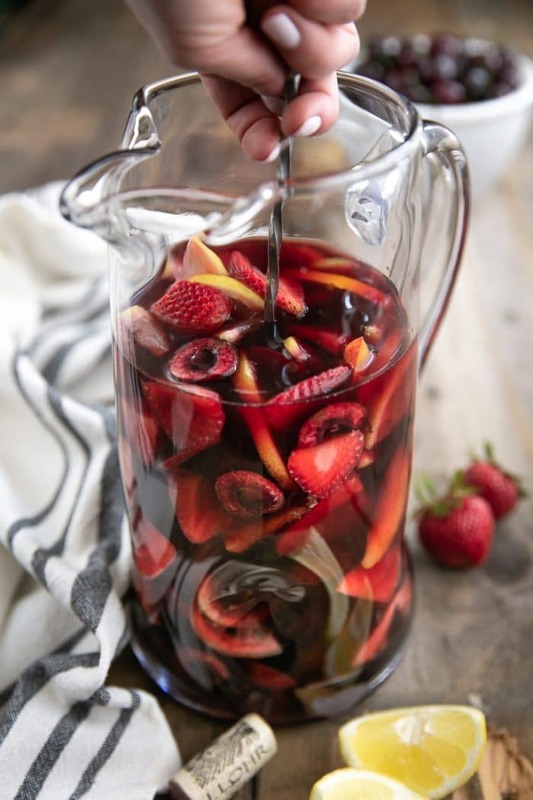 All sangria recipes call for a few simple components, that, when mixed together should make a magical, delicious, fruity wine punch. The rules for making sangria are flexible, so add your favorites. Wine. 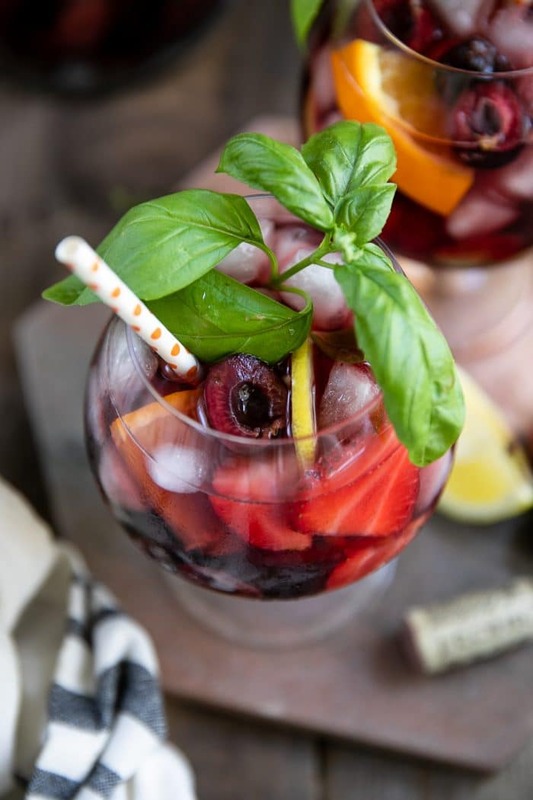 The type of wine you choose to use will vary depending on why type of sangria you are looking to make- red, white, sparkling? Stronger stuff. As mentioned above, it is believed that the more “traditional” sangria was mixed with brandy. However, try something new like vodka, rum, flavored liqueur, etc. A Mixer. Sangria, when done correctly, is delicious and dangerous. So, unless you want to be asleep on the floor by 8 pm, it is recommended that a little juice or carbonated water be added. In the case of this Strawberry Lemonade Sangria Recipe, I added strawberry lemonade. It added just the right amount of sweetness. Sweetener. Some people add sugar. Some people do not. In the case of this Strawberry Lemonade Sangria, added sugar was NOT necessary. That said, I can’t speak for all Sangria recipes. Fruit. Fresh, ripe, seasonal fruit is always the best choice. Sangria is super easy to make. 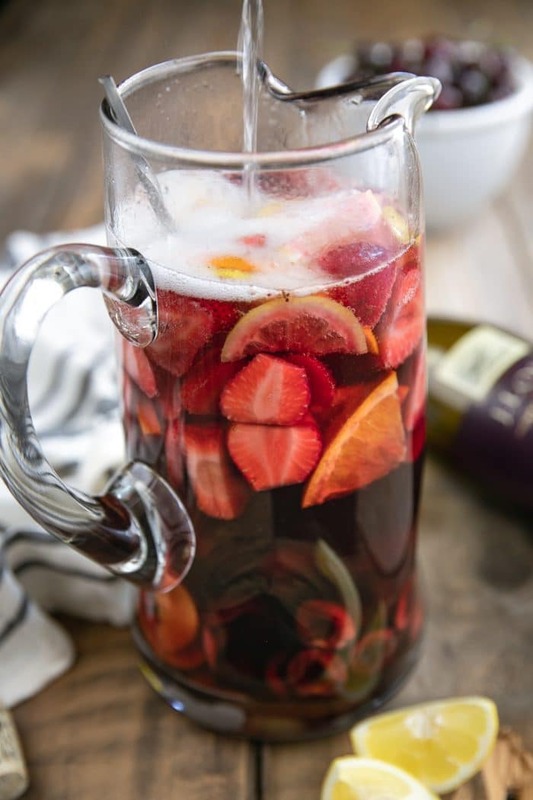 And this Strawberry Sangria Recipe? Could not be easier. Use a wine you know you’ll love. I grabbed a wine with notes of orange and cherries. In other words, if you absolutely love a $4 bottle of wine, then use it! Fresh, ripe, seasonal fruit is always best. It doesn’t matter if you’re soaking fruit in booze, unripe fruit is unripe fruit and always will be. Fresh, ripe strawberries and cherries will produce a much more beautiful flavor than their unripe and bitter comrades. Muddle the fruit in the hard alcohol and juice…but not too much. You don’t want a pulpy mess, but a little muddling to help release some of the flavors is never a bad idea. Don’t add too much hard stuff. But don’t forget the hard stuff either. 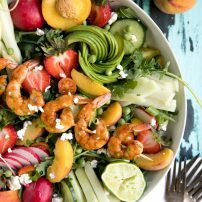 Make sure you let the fruit and the wine soak for at least 30 minutes before adding any carbonated water and serving. On the flip side, longer is not always better- it’s best to enjoy your sangria withing 24 hours. BUT REALLY? 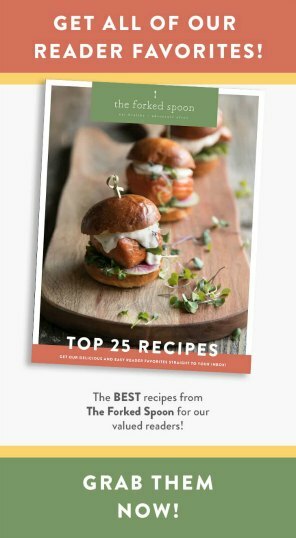 SANGRIA RECIPE WITH RUM? I’ll be honest, I surprised myself, too. In general, I’m not much of a rum kind of a gal, but it totally makes sense in this Strawberry Lemonade Sangria. Besides, rum practically screams SUMMER in your face. And, since I wanted to use this Falcon’s Perch Pinot Noir with cherries and strawberries, I knew the spiced rum would give it a nice, light, summery balance. You guys, it’s honestly the most dangerous strawberry sangria recipe you will ever make…in a good way! Classic Sangria is good, but this Strawberry Lemonade Sangria is better. 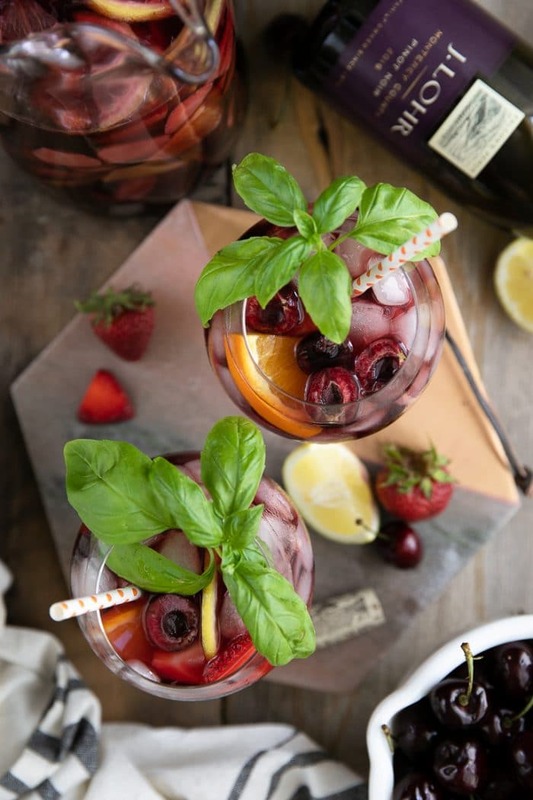 Made with fresh basil, Pinot Noir, spiced rum, strawberry lemonade, and mixed fruits like strawberries and cherries, this summer Sangria is guaranteed to be one you make over and over again. 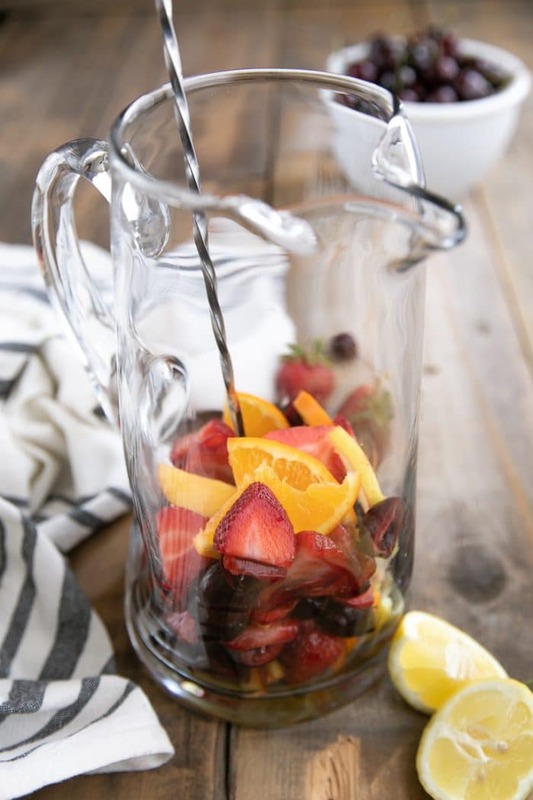 Add the strawberries, cherries, peach, orange, and lemon slices to a large pitcher. Add the rum and strawberry lemonade and gently muddle to extract the flavors of the fruit into the juice and alcohol. Pour the red wine into the pitcher and stir to combine. Cover and refrigerate for 30 minutes. When ready to serve, fill a glass with ice and fill three-fourths of the way full with sangria. Top off each glass with bubbly water or lemon-lime soda. Garnish with fresh basil, if desired.